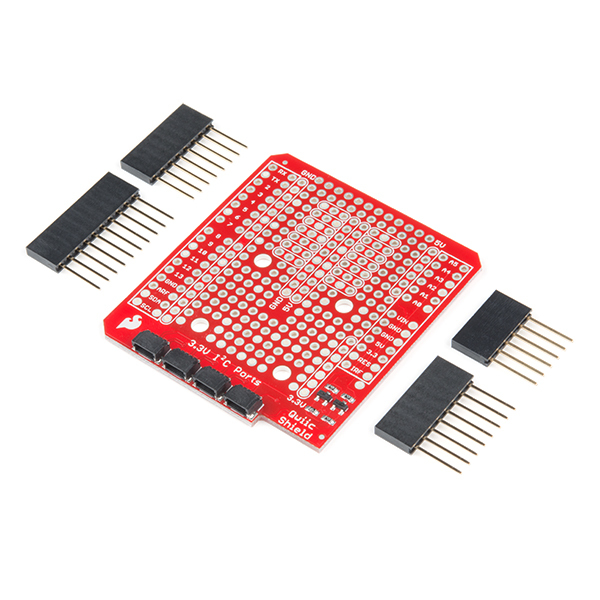 The SparkFun Qwiic Shield is an easy-to-assemble board that provides a simple way to incorporate the Qwiic Connect System with your Arduino-based device. 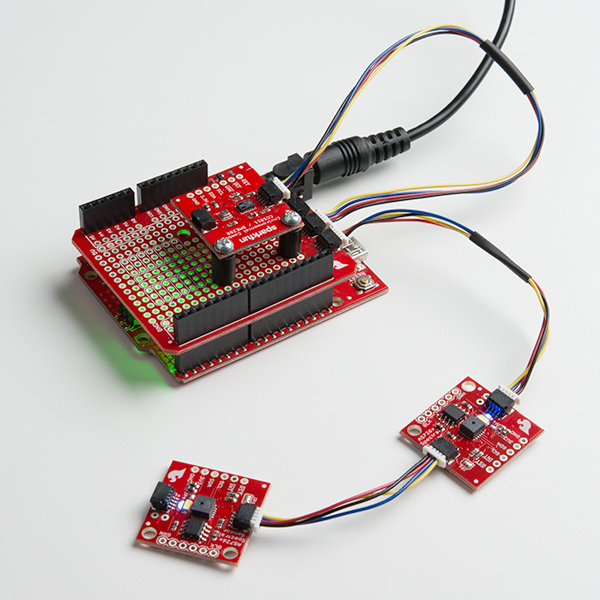 This shield connects the I2C bus on your Arduino to a series of SparkFun Qwiic connectors and provides the circuitry to convert the 5V given to the 3.3V required by I2C boards in our Qwiic system. As long as your devices are on different addresses, the Qwiic system allows for daisy chaining, meaning you can stack as many sensors as you’d like to create a tower of sensing power! 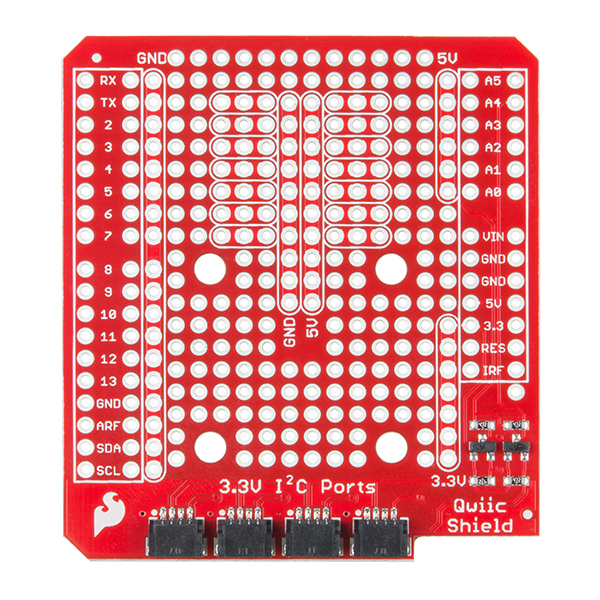 The Qwiic Shield has four Qwiic connection ports, all on the same I2C bus, as well as a large prototyping area to design and make your own unique circuits. 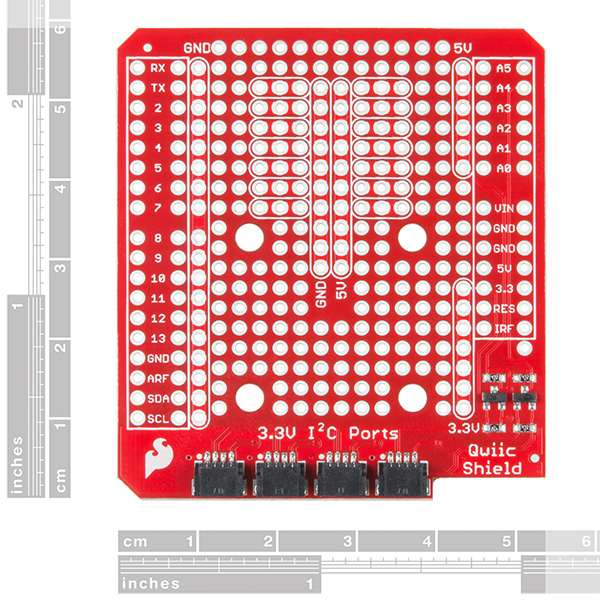 The shield also has a few 3-by-1 rails to help with prototyping, as well as buses for ground, 5V and even 3.3V. We have included four mounting ports in the same design as our Qwiic sensors, allowing you to affix your small board to the top of the shield. This shield is a great retrofit for any Uno you may have. What a solder free solution? 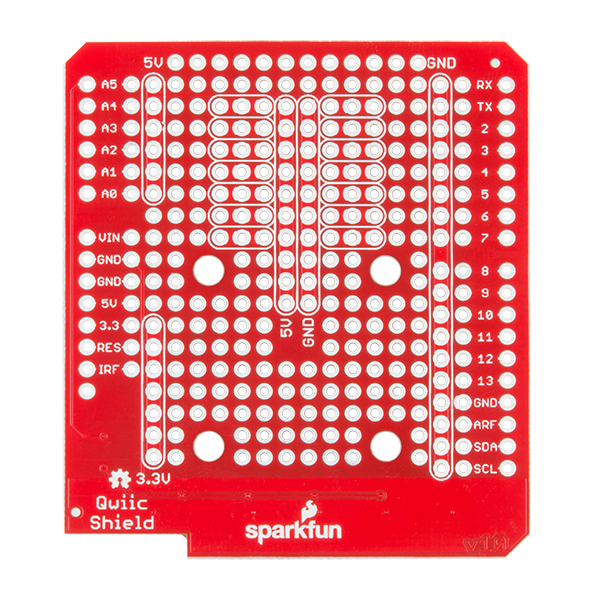 Skip the shield and checkout the SparkFun BlackBoard which has the Qwiic system built in! Note: This includes R3 Arduino headers, but they are not pre-soldered onto the board, so some assembly will be required when putting the shield together. Agree with the above. There's also the problem that the HV SDA and SCL signals are connected to A4 and A5, not the SDA and SCL pins meant to be used since the R3. Using A4 and A5 means that this shield won't work with the Leonardo and the Mega. Am I missing something? Why doesn't this use IOREF for the high-side voltage, which is put there specifically to allow shields to be used interchangeably with 3V3 an 5V Arduino varieties? Sure, I can rewire some things, but it makes no sense to do it this way. "This shield is a great retrofit for any Uno you may have." is simply not true. This doesn't work as a Qwiic shield on boards like the Turbo. However, I think the prototyping area is better than what is provided on the actual ProtoShield that is sold.